I believe that the economic prosperity of a nation and its people is tied directly to their ability to create and innovate with technology. In my life, I want to help make more of this happen. I want to create jobs, enable people and educate. I want to help health professionals find more value from their learning. I want to help kids innovate and create with technology. And, I want to help people build better, and more scalable companies here in Australia. My dad helped me build my first website at age 11, it was an online Pokédex and lego website. I went on to start my first company at age 14, filming folk music festivals around Victoria, editing the footage and selling copies of the final movie for $10 each. I sold about $1.5K worth of videos at one event alone. A highlight from this activity was being asked to have one of my videos broadcast on the big screen at Federation Square in Melbourne. At age 16 I ran a clothes stall with my brother and sisters at the Laverton market, in Melbourne – we would purchase brand clothes from the local op-shops, iron and wash them before selling them for 10x on market day. My dad exposed me to software and my mum exposed me to business. In November 2007 I started working at Ausmed Education, an amazing company founded by my mum, a nurse, in 1987. It was around this time that I first became interested in digital marketing, especially SEO. Over the next few years Ausmed grew to become one of the main private providers of ongoing education for health professionals in Australia (ausmed.com.au). On the back of this success, we expanded our horizons. We began building ausmed.com, a website designed to take the best of Australia’s health education and nursing and midwifery knowledge to the world. In my mind, Ausmed represents the perfect company – it’s future focused and highly ethical. It has strong values centred around education, technology, betterment and healthcare. It looks after its customers just as much as its employees and most importantly for me, it uses the Internet to champion and distribute Australia’s high-quality health education to the world. 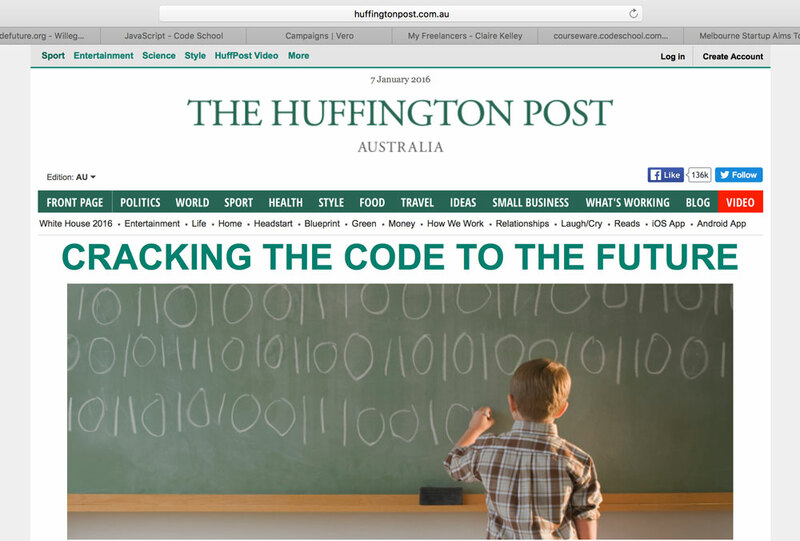 In late 2014 Bec Spink, a primary school teacher, and I co-founded Code the Future, a not for profit organisation that connects school teachers with volunteer software developers to help teach kids how to code. We’ve scaled quickly, with 1000s of teachers and developers signed up to use our platform, and coding projects being posted in many countries. In little over two years we have provided over 2,000 kids with tangible, real world technology, coding and entrepreneurial skills. In 2017, Code the Future will continue to mature as an organisation, and have an even greater impact. I’m privileged enough to also have the opportunity to work with Mike Bird and George Glover at Social Garden. The Garden, as we call it, is a fantastic place that enables people and ideas. It was recently recognised as one of the fastest growing companies here in Australia, and is a global leader in high-value lead generation and sales conversion. Stocklight is a leading non-bank stock market portfolio app. In my role as Growth Advisor, I support Jason Kotchoff and the team to increase engagement, retention, activation and scale user acquisition. In the first 12 months of supporting Stocklight, user engagement has grown 500%. Firststep is an Australian micro-investment and savings platform that assists users to automatically round up their spending and save money. It’s early days, but my role is to support the team with user acquisition, activation and retention.